A Package Handler takes responsibility of assembling, sealing, scanning and loading parcels. 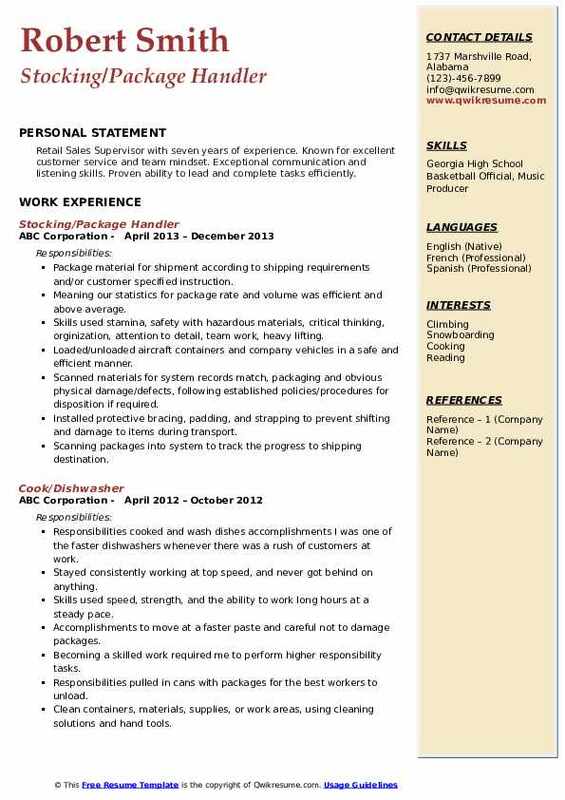 Typical job duties mentioned on the Package Handler Resume include the following – working with team members to ensure that the right amount and packages are loaded into the trucks; reading and comprehending labels, following safety rules; using scanners to track parcel details such as receipts and conditions; sorting items as per destination clause; operating hand tools and loading equipment and lifting heavy packages or parcels. Required knowledge, skills, and abilities include the following – excellent hand-eye coordination, strong listening skills, good critical thinking skills, the ability to monitor gauges and machines that check accuracy; strong reading comprehension skills, strong negotiation skills, a clear understanding of safety and security issues; and knowledge of zip codes. A high school diploma or GED is required. Job skills will be useful. Summary : An organized, detailed-oriented, and conscientious self-starter, able to strategize and prioritize effectively to accomplish multiple tasks and stay calm under pressure. Completed training on all tug rules and regulations in a busy warehouse and production environment. Operated an electric tow motor and pick up and deliver packages and containers to production line. Properly loaded and unloaded materials controlled conveyer belts for steady operation prepared schedules for quicker techniques for loading/unloading. Examined and inspected containers, materials, and products to meet packing specifications. Clean containers, materials, supplies, work areas, using cleaning solutions and hand tools. 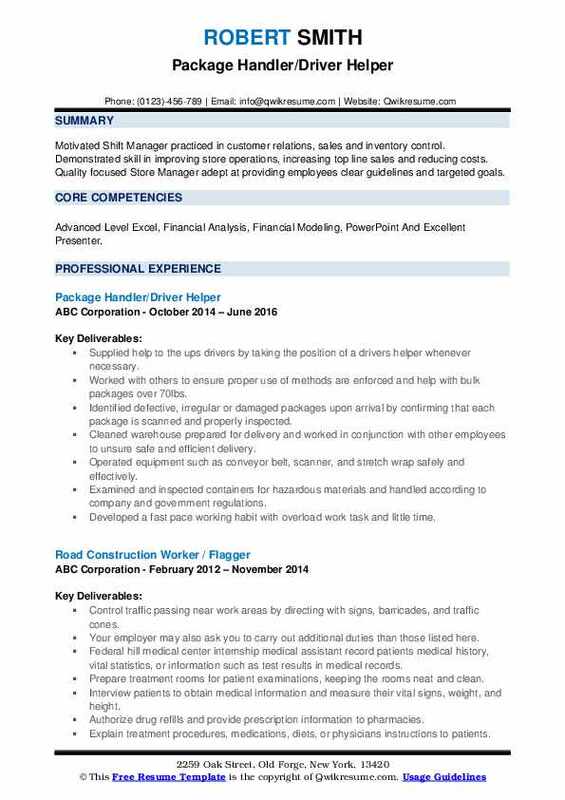 Objective : Motivated Shift Manager practiced in customer relations, sales and inventory control. Demonstrated skill in improving store operations, increasing top line sales and reducing costs. Quality focused Store Manager adept at providing employees clear guidelines and targeted goals. Skills : Advanced Level Excel, Financial Analysis, Financial Modeling, PowerPoint And Excellent Presenter. Supplied help to the ups drivers by taking the position of a drivers helper whenever necessary. Worked with others to ensure proper use of methods are enforced and help with bulk packages over 70lbs. Identified defective, irregular or damaged packages upon arrival by confirming that each package is scanned and properly inspected. Cleaned warehouse prepared for delivery and worked in conjunction with other employees to unsure safe and efficient delivery. Operated equipment such as conveyor belt, scanner, and stretch wrap safely and effectively. Examined and inspected containers for hazardous materials and handled according to company and government regulations. Developed a fast pace working habit with overload work task and little time. Objective : Driven to exceed goals and build long term goals. Delivers positive experiences through high-quality care. Friendly Associate adept at working in diverse atomospheres focused on producing high quality products that exceed customer expectations and help achieve company production and revenue goal. Delivered packages to correct house and or apartment with a rate of at least twenty-two stops an hour while driver helping. Consistently meets goals, efficient multi-task, sound judgment and coursework in warehouse operations. 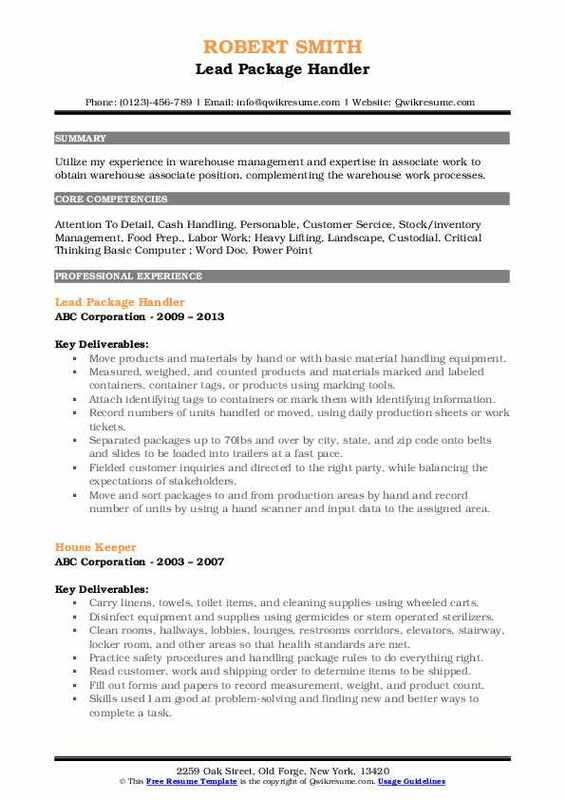 Focus operations clerk with extensive experience in material handling, inspections and shipping and receiving. High energy manages successful in building and organizing orders and shipping labels. Moved products and materials by hand or with basic material handling equipment. Cleaned the warehouse, prepared packages for delivery by scanning them in and sorting them out. 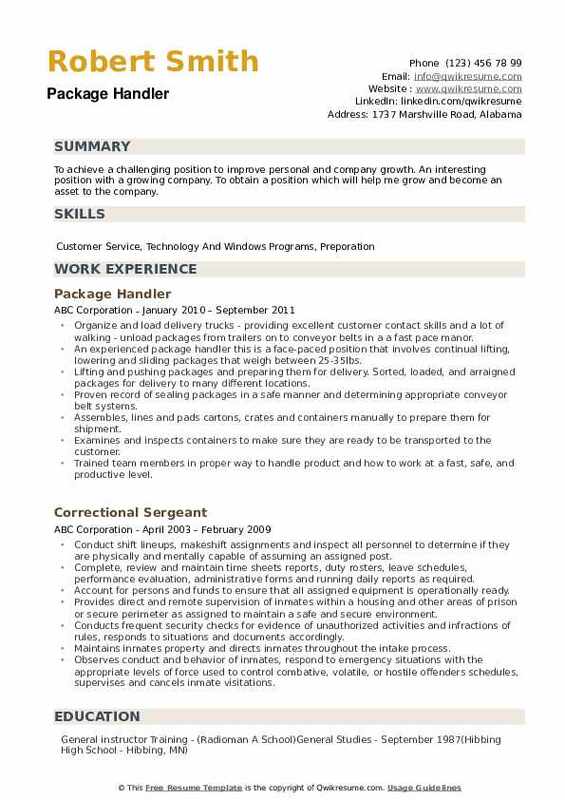 Objective : Self-motivated, professional worker with experience in the fields of customer service and security; seeking to leverage the expansion of current professional experience to obtain a position in the field of criminal justice. Load and unload packages onto or from delivery vehicles, conveyor system carts, and load ratings. Measured and weighted packages while thoroughly examining to ensure packing specifications are constantly met. Organized and monitored packages by determining marked labels and weighing packages to ensure packing specifications are properly met. Practice safety procedures and handling package rules to do everything right. Ensure correct location load and unload packages quickly and efficiently. Headline : Project manager, writer, and editor with skills that can be applied to a wide range of written materials. To borrow a phrase coined by a previous employer: Dedicated to bringing the art of storytelling to businesses looking to enhance their brand with clever prose and unique ingenuity. Load/unload aircraft containers and company vehicles in a safe and efficient manner. Using phasar/cosmos trackers, scans and sorts packages according to service type and destination, in compliance with established procedures. Remains current on phaser/cosmos tracking methods and shipping requirements as needed. Completes systematic transactions such as stocking, receiving, transfers, returns, etc. Maintains the inventory of personal uniforms and safety equipment in accordance with corporate standards. Scans materials for system records match, packaging and obvious physical damage/defects, following established policies/procedures for disposition if required. Manually sorts packages/documents to appropriate slide, line, belt and/or container for final distribution. Headline : Reliable and friendly customer service representative who quickly learns and masters new concepts and skills. Passionate about helping customers and creating a satisfying experience. Attach identifying tags to containers or mark them with identifying information. Cleaned the warehouse, prepared packages for delivery by scanning them in and sorting them out. Worked in smalls department where we separated and bagged packages under 5 pounds. responsible for loading/unloading packages on to or off trucks. Placing each package in the order of each delivery based on the location of the area. Unload trailers in a limited time with the assistance of a scanner outside trailer to scan packages to be sorted in sorting towers. Objective : Responsible Associate dedicated to providing the highest level of service. Reliable and efficient with duties and ability to multi-task. Attention to detail. Self-directed and motivated team player who works well independently. Manual secondary manually sorts packages/document to appropriate slide line, but to final distribution. Ensure the use of safety procedures when handling packages unload container safety efficient manner. Scan packages perform a quick inspection of packages separating open or damaged packages for further inspection. Daily handle 1000's of packages ranging in weight from less than a pound to 150 pounds. Remove packages from the conveyor belt and place them on rollers to be loaded in trucks. 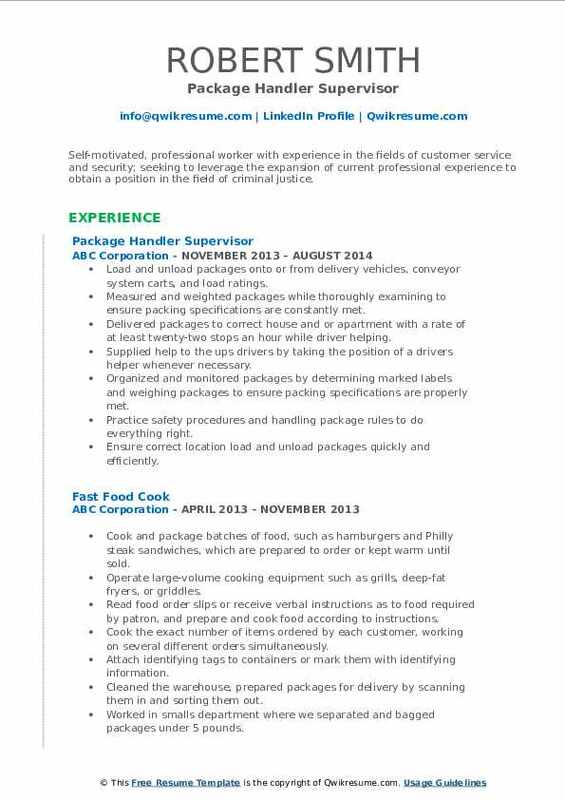 Package handler-assist in the process of getting packages to their destination. 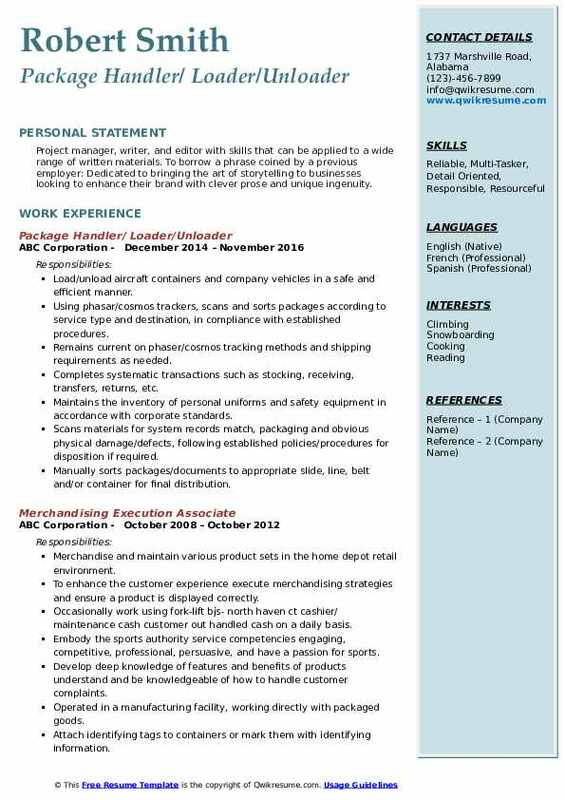 Summary : Utilize my experience in warehouse management and expertise in associate work to obtain warehouse associate position, complementing the warehouse work processes. Measured, weighed, and counted products and materials marked and labeled containers, container tags, or products using marking tools. Separated packages up to 70lbs and over by city, state, and zip code onto belts and slides to be loaded into trailers at a fast pace. Fielded customer inquiries and directed to the right party, while balancing the expectations of stakeholders. Move and sort packages to and from production areas by hand and record number of units by using a hand scanner and input data to the assigned area. 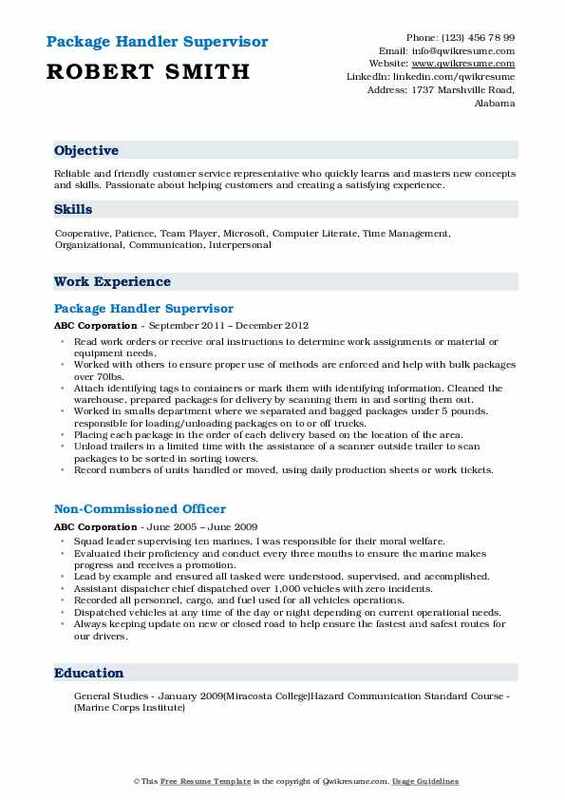 Objective : Retail Sales Supervisor with seven years of experience. Known for excellent customer service and team mindset. Exceptional communication and listening skills. Proven ability to lead and complete tasks efficiently. Package material for shipment according to shipping requirements and/or customer specified instruction. Meaning our statistics for package rate and volume was efficient and above average. Skills used stamina, safety with hazardous materials, critical thinking, orginization, attention to detail, team work, heavy lifting. Loaded/unloaded aircraft containers and company vehicles in a safe and efficient manner. Scanned materials for system records match, packaging and obvious physical damage/defects, following established policies/procedures for disposition if required. Installed protective bracing, padding, and strapping to prevent shifting and damage to items during transport. Scanning packages into system to track the progress to shipping destination. Headline : To achieve a challenging position to improve personal and company growth. 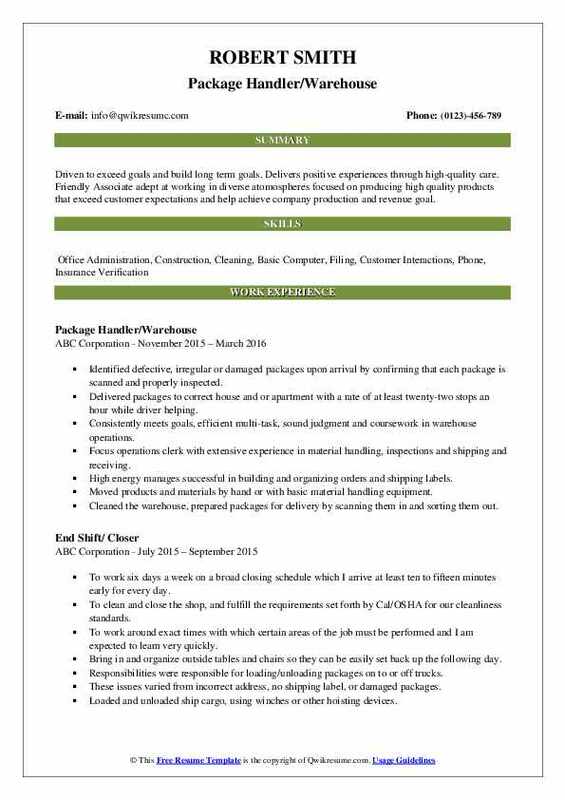 An interesting position with a growing company. 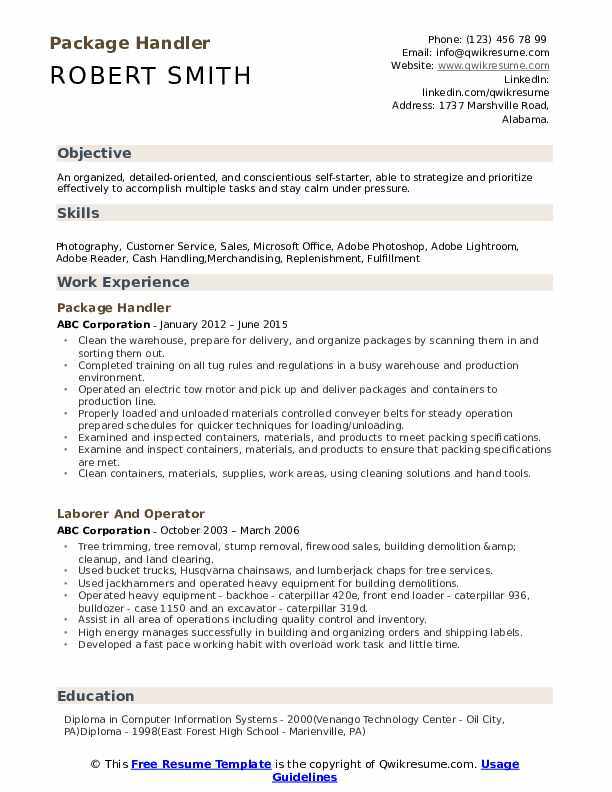 To obtain a position which will help me grow and become an asset to the company. Organize and load delivery trucks - providing excellent customer contact skills and a lot of walking - unload packages from trailers on to conveyor belts in a a fast pace manor. 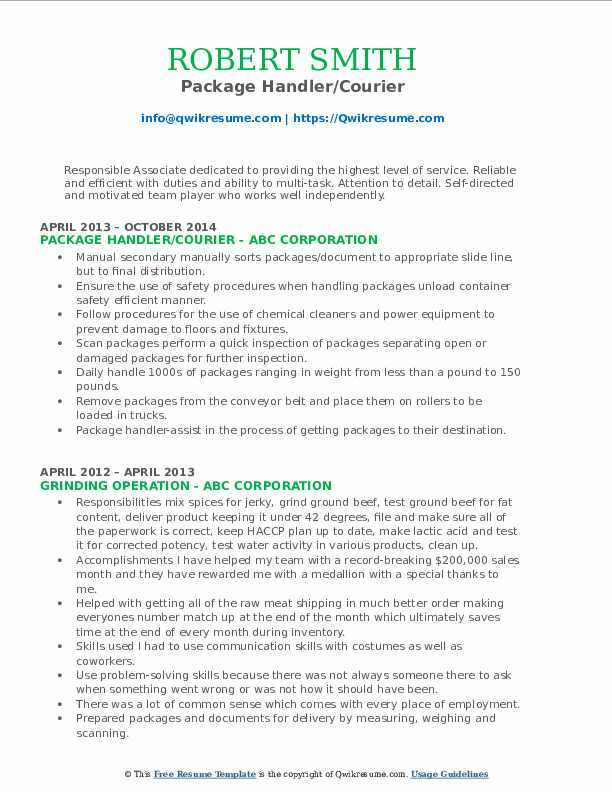 An experienced package handler this is a face-paced position that involves continual lifting, lowering and sliding packages that weigh between 25-35lbs. Lifting and pushing packages and preparing them for delivery. Sorted, loaded, and arraigned packages for delivery to many different locations. Proven record of sealing packages in a safe manner and determining appropriate conveyor belt systems. Assembles, lines and pads cartons, crates and containers manually to prepare them for shipment. Examines and inspects containers to make sure they are ready to be transported to the customer. Trained team members in proper way to handle product and how to work at a fast, safe, and productive level.